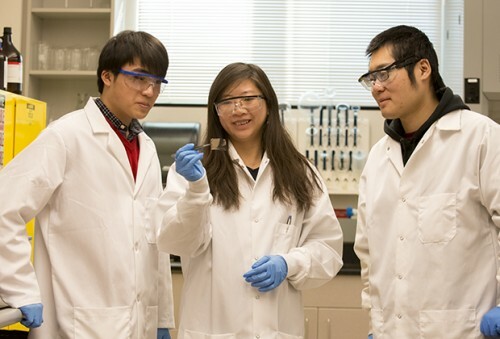 Claire Xiong, center, works in the engineering lab with students. Carrie Quinney photo. Micron School of Materials Science and Engineering Associate Professor Hui (Claire) Xiong recently was awarded a National Science Foundation grant of more than $300,000 to further her research on electrode materials used in lithium ion batteries. The award is part of a larger grant split between Boise State University and Purdue University. Xiong’s goal is to significantly improve the performance of lithium ion batteries. These batteries are among the most promising energy storage technologies and are much needed for near-term growth of the renewable energy and electric vehicle markets. Xiong explained that recent research has demonstrated improved battery performance when electrode materials contain defects. This could potentially lead to extend battery energy, power density, stability, tolerance in extreme conditions and calendar life. Xiong hopes the project will create more informed system, shielding and protection design for energy storage technologies. This is vital, as batteries are increasingly being used in applications potentially subjected to high radiation fields, including satellites and high-altitude aircraft; advanced sensor technologies for homeland security, defense and power production; remote warfare; nuclear-powered submarines and aircraft carriers; and healthcare. “Ion irradiation is related to the bombardment of a target with energetic ions and is known to induce defects in crystalline solids. We want to understand the effect from ion irradiation on the conductivity for these types of materials in terms of how they conduct electrons and ions to see if we can enhance the electrochemical properties of these electrode materials,” said Xiong.